Then again, it never is. But Middleton’s hockey team is ready and excited about their postseason chances. The Cardinals closed out the regular season with a 4-0 blanking of Madison West last Tuesday. Middleton finished the regular season in second place in the Big Eight Conference at 11-3 and went 17-5 overall. Now, it’s on to the postseason. Middleton, the No. 2 seed in its sectional, hosts seventh-seeded Madison Memorial Thursday at 8 p.m. at Capitol Ice Arena in a regional. If the Cardinals win there, they’ll most likely host third-seeded Madison Edgewood Tuesday in a sectional semifinal at 8 p.m.
Middleton’s girls’ basketball team wanted to prove it could knock off one the top teams in the Big Eight Conference when if faced second-place Verona last Saturday. And the Cardinals found themselves in prime position to do just that until it all unraveled at the end. Middleton led by nine points at halftime and took a seven-point lead into the final quarter, only to watch the Wildcats rally to tie the game in regulation. The Cardinals then dropped a heartbreaking 43-41 overtime decision. 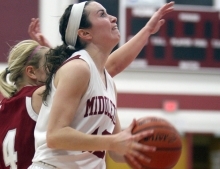 Middleton, which remained in fourth-place in the league, dropped to 11-7 overall and 9-5 in the Big Eight Conference. Verona improved to 15-4 and 13-2 and swept the season series from the Cardinals for the first time since joining the league nine years ago. Middleton’s boys basketball team received the No. 4 seed at its WIAA Division 1 Sectional Saturday morning. The Cardinals will open postseason play by hosting fifth-seeded Madison West on Feb. 22 at 7 p.m. in a regional semifinal. Middleton and Madison West split their two games this season, with both school winning its home game. Sun Prairie, which leads the Big Eight Conference by ½ game, is the No. 1 seed. Madison Memorial is No. 2, followed by Madison La Follette, Middleton, Madison West, Watertown, Madison East, Verona and Oconomowoc. After the initial votes are tabulated, teams have a chance to appeal. Middleton appealed its seed and lobbied for the No. 3 position. But Cardinals coach Kevin Bavery lost the re-vote to Madison La Follette, 4-3. Middleton has an 11-8 overall record and is 9-6 in the Big Eight Conference. Madison La Follette is 10-10, 9-7. 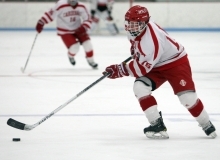 Middleton’s hockey team is in the middle of its roughest stretch of the season. But the Cardinals refuse to blink. That’s made for some terrific results now — and bodes extremely well for the upcoming postseason. Middleton defeated rival Madison Edgewood, 4-2, last Thursday. The Cardinals then upended Fond du Lac — the No. 2 team in the state — 4-2 on Saturday. Middleton also lost to 10th ranked Eau Claire Memorial, 5-2, on Sunday. With a game against No. 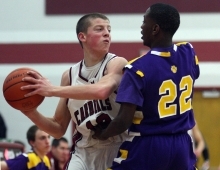 2 Verona set for Thursday at 7 p.m. at the Eagles Nest, Middleton is in a murderous stretch. So far, though, so good. “Pretty big stretch for us,” Middleton co-coach Steve Libert said. Middleton’s win over Madison Edgewood was a huge one for postseason seeding. By defeating the Crusaders, the Cardinals (14-4 overall, 8-2 in the Big Eight) are almost a lock to get the No. 2 seed in their sectional. That means Middleton would have home ice until the sectional finals. Middleton’s boys and girls basketball teams, in conjunction with the American Cancer Society, will host ‘Coaches vs. Cancer’ events on Thursday and Friday. Middleton’s girls host Madison East on Thursday and the boys host Verona on Friday. Both games start at 7:30 p.m. The sophomore games begin at 5:45 p.m. with the Coaches vs. Cancer organization setting up by approximately 6 pm. This year’s girls game will honor three Middleton High School staff members who have all battled cancer head on — Karyn Baxter, Linda Bremmer and Kathleen Shaffer. The boys game will honor James Helmuth, a fifth grader at Elm Lawn Elementary School. Helmuth is a basketball player as well as a huge fan of the game. Helmuth was diagnosed with adrenal cortical carcinoma nearly a year ago. He continues to inspire others as he battles this disease. The girls basketball teams from Middleton and Janesville Parker have dominated the Big Eight Conference for more than two decades now. So it almost seems fitting that the Cardinals’ current run will be stopped by the Vikings. Middleton dropped a 49-41 decision at Parker last Friday that signaled a changing of the guard — at least for this season. Parker built a 20-point first half lead, then held off the hard-charging Cardinals in the second half. The Vikings stayed unbeaten in the Big Eight, improving to 12-0 in the league and 14-1 overall. Middleton — which has won or shared six straight conference titles — slipped to 6-4, 8-6. When it comes to conference titles and championships, no one likes to share. But Middleton’s wrestlers weren’t complaining much last Friday. The Cardinals downed Madison La Follette, 54-12, and wrapped up a share of the Big Eight Conference title. Middleton, Sun Prairie and Janesville Craig all posted 8-1 records in the Big Eight dual meet season and shared the title. Middleton’s hopes of earning a share of the league title seemed bleak after it lost to Sun Prairie on Jan. 8. But Sun Prairie later fell to Janesville Craig, creating the logjam at the top of the standings. Middleton had several top notch performances against the Lancers to earn a share of the league title. Kevin Bavery had waxed poetically for nearly 17 minutes. Middleton’s boys basketball coach had talked about the toughness, courage, resilience and grit his Cardinals showed in a thrilling 81-79 overtime win over visiting Madison East Thursday night. Then the boss chimed in. With that, an exhilarating night for Bavery and his Cardinals was done. But what a night it was. Middleton lost a 15-point halftime lead, blew a 7-point advantage in the final minute, then needed a Derek Rongstad free throw to force overtime tied at 75. The Purgolders scored the first four points of O.T., but Middleton closed the game on a 6-0 run to notch arguably its most exciting win of the year. Senior forward Kade Schultz hit six three-pointers and led the Cardinals with 18 points. Rongstad had 17 points, including 10 in the fourth quarter alone. It wasn’t always pretty. Far from it. But Middleton’s girls basketball team took care of business last week, defeating two of the Big Eight Conference’s bottom feeders. The Cardinals defeated Madison Memorial, 41-30, last Thursday. 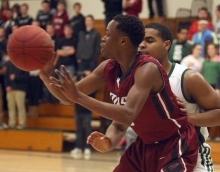 Middleton then ran past Beloit Memorial, 72-51, last Saturday. The Cardinals improved to 8-5 overall and 6-3 in the league, which is good for fourth place. The Cardinals had a rough offensive night against the Spartans (2-8, 2-12). Middleton led, 10-8, after the first quarter and 25-19 at halftime. The Cardinals’ advantage was just 30-23 through three quarters, then they held Memorial off in the fourth quarter. It was a happy homecoming for Kari Steck and her Middleton girls gymnastics team. Steck, the Cardinals’ second-year coach, returned to her hometown of Hazel Green for the Southwestern Invitational last Saturday. And Middleton helped make Steck’s return home a pleasant one. The Cardinals finished second with a 136.85 team score. Mukwonago-Kettle Moraine won the event with a 140.35 score, while Platteville/Belmont/Lancaster was third (136.25) and Holmen (134.625) was fourth. Aryn Skibba, Middleton’s top all-arounder, competed in just one of the four events as she rested some minor injuries. “This is an incredible team score that shows the growth of the team over the past few weeks,” Steck said. “Without Aryn's score on three of the four events, the girls still topped our second-highest team score of the year at a meet where Aryn competed all events.